Upon returning from my overnighter on the Skokomish River, I found an interesting email awaiting me. My friends over in the BFRO sent me a recent sighting report that they wanted me to look into. Apparently a woman saw a sasquatch run across the road outside of Molalla, OR just the previous Friday, June 18th. The email contained the witness contact information, so I gave her a ring and arranged to meet her a little later that same day. The previous day's efforts to obtain a footprint cast had been thwarted, so I was excited to have another opportunity to possibly obtain such a prize. It had only been three days, and this time the witness would be taking me to the exact location. I met the witness in Molalla and she led me off driving into the woods. Before long we rounded a bend and parked at a trail head. We backtracked down the road a few hundred yards and she pointed to the steep incline to show me where she saw the bigfoot. 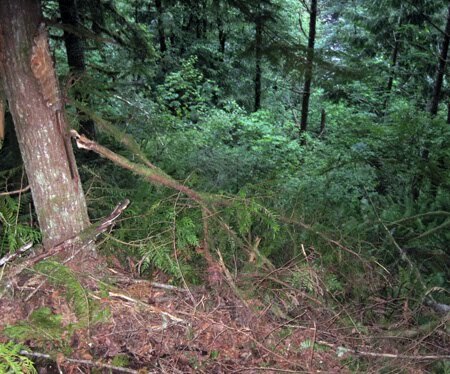 Her story is that she was turning a corner in the road when something big moving through the brush caught her eye up on the steep embankment on the south side of the road at about a 100 yards distance. When she initially saw it, she could see something large and yellowish/brown moving towards her, parallel to the road. It stopped for a brief moment, and she did the same out of shock at the size of whatever this was she was looking at. Her car was brought nearly to a standstill. 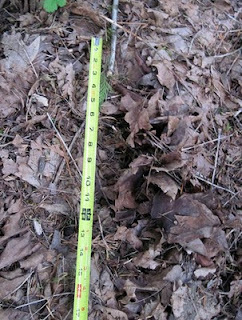 The view from where the witness initially saw the creature. She then saw the thing turn towards the road and run down the steep hill very quickly. As it ran the witness could clearly see two long arms swinging widely, and the thing was running on two legs. 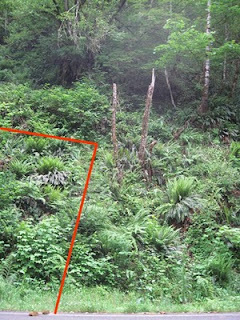 The creature disappeared from her sight temporarily behind some brush, and the witness moved her vehicle ahead to clear her view of the area from the interfering foliage. She lost sight of the creature for only a few seconds. The creature's view of the road from where it briefly stood still. When she came around the corner the sasquatch had already made it across the road and had disappeared from view. The witness sped up to try to close the distance so she could see it again. She caught sight of it as she nearly passed it. It was standing a short distance down the embankment on the north side of the road. She could see it from the middle of the back to the top of its head. Its left arm was touching a branch which it broke as it moved downhill past the tree it was growing from. This portion of her sighting was from a very short distance, perhaps 40 feet. While interviewing the witness at the scene, her excitement was clearly evident. She and I spent the next three hours at the location with her retelling me the story again and again. I would ask questions to clarify points and to obtain details that were important to me. I spent a great deal of time on both hillsides tracking where this thing went. As far as I can tell, it powered its way through the thick brambles and devils club that grew out of the hillside, and stopped just above and over from two snags. 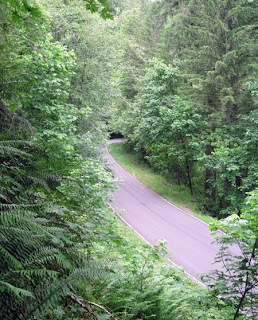 I believe it then ran down the east side of the trees, jumping over the swampy ditch and running up the road fifteen or twenty yards and down the opposite hill to the nearby Molalla River. The path I believe the sasquatch took down the hillside. The embankments were muddy and steep (I would estimate at least a 50 degree slope, possibly a little more). In several spots the soft ground gave way and slid out from under me as I stood on the hillside. 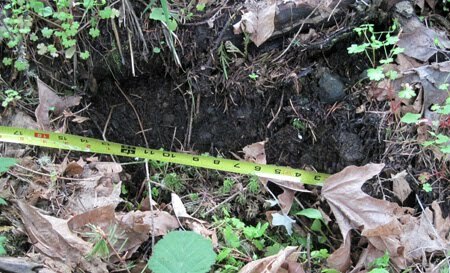 I eventually located large (15 inch) impressions leaving a trail down the hillside. As muddy as the hillside was, the impressions had to definition to them. Bewildered, I looked at my own tracks as I left them and noticed that even my boot prints were only vaguely defined and did not leave the impression of the treads in the ground. The witness and I located several more of these large impressions on both sides of the road. Some of the impressions from both sides of the road. She pointed out the branch she saw it break as it passed the tree she saw it next to before we headed down to the river to look around for more footprints. That was a rough road to travel that turned up nothing but mud, deer bedding sites, and lots of pokey bramble bushes that obstructed most paths. The branch the sasquatch broke from the tree as it passed. A little more time was spent looking around for something interesting, but we turned up nothing. Before too long we went our separate ways. Being put on a fresh sighting is one of the biggest thrills of bigfooting. For me, the possibility of obtaining some physical evidence is a main reason I do this. 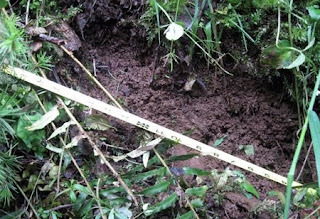 This time I got some photographs of large impressions on a muddy hillside. Not bad. I believe the witness saw a sasquatch. 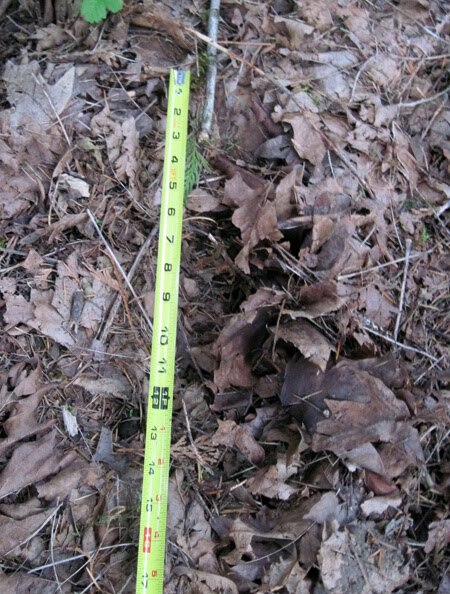 Her story had details that I saw evidence for, such as a broken branch on a tree and impressions. The witness' enthusiasm and consistency in her story gives some indication that she is not hoaxing, as does her willingness to drive from Beaverton to Molalla on a Monday evening just to share her story. Could she be lying? I guess, but I don't think she was. After spending three hours with her, I just didn't get that impression. Since sasquatches are perfectly real animals, it makes sense that many, if not most, of the people who say they saw one probably did. Dude, nice report...right in our "backyard". thats my girl ! we have camped there for years and we heard whistle's banging and howles ! Bigfoot LIVES ! i have a conspiracy theory and was wondering about it. i know some people who were driving deep into the molalla hills and it was really late at night. and 5 people all claimed that they saw the mountains split apart like it was some kind of government base. could it be that a bigfoot in the molalla hills is a result from human testing gone wrong? im not sure but if there was a secret base up in the hills what better spot to do it then in the mountains themselfs? 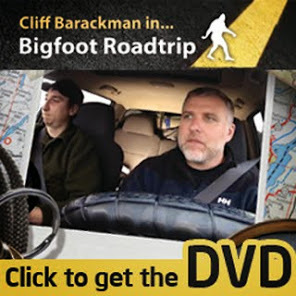 I really don't think it's a government conspiracy given the length of time rd that sasquatch has been seen. It wasn't possible to alter DNA back in the 1800's, so, that sounds like one of those government conspiracy paranoia tales. It's just an animal thatkeeps out of sight as much as possible, occasionally gets seen, and, this far hasn't been killed or captured. It must be intelligent and more than likely disposes of it's dead since we have no skeletal remains thus far.